Our hotel in Bangkok was never going to get the attention it deserved when I arrived deep into the evening, or that’s at least what I thought. After being awake since the early hours of the morning, plus the nine-hour flight from Bangkok and the time spent in the city’s notoriously bad traffic, I just wanted to go to bed. As I disembarked from the vehicle that had brought us here from Suvarnabhumi Airport, the neon lights of Chinatown were calling, beckoning me to come and share in the night time fun. The bar at the front of our hotel, the Shanghai Mansion was another temptation. Late at night, the heat and humidity in Bangkok are suffocating, and the cold beer being delivered to the bar patrons is oh so tempting. I’ve got a big week ahead of me though, so I decide to be a grown-up and head for the lobby. The Shanghai Mansion exudes warmth and style from the moment I walk across the timber bridge and into the foyer. Dark brown brick columns support the high, open ceilings, creating a feeling of space that is not always easy to find in a tightly packed city like Bangkok. Rich colours are a signature feature of this boutique hotel in Bangkok and it is immediately obvious that the design of this hotel has not taken a standard cookie-cutter approach. There is no large desk here, just a small table, where staff are seated, awaiting our arrival. Our check-in is quick which is beneficial at this time of night but always welcome whatever the time of day. I still wonder why some hotels can process my mere details in a heartbeat, whereas others seem to take an eternity. Thankfully, if it does take a little longer here, there’s a comfortable seating area to wait in. Though weary, my eyes light up as we hop out of the lift and into the main accommodation area. A carefully designed floor-to-ceiling void is the centrepiece that separates the rooms on either side. Running all the way to the sixth floor, brightly lit lanterns give way to a pond, brimming with goldfish. A feeling of peacefulness falls over me, or maybe that’s jetlag? The hotel runs backwards away from the frenetic pace of Yaowarat Road, as opposed to being built vertically, like most luxury hotels in big cities. If I hadn’t stepped out onto the busiest road in Chinatown minutes earlier, I would barely remember it was there at all. It’s so quiet here. “How long are we staying here?”, I ask a fellow traveller. Without having even seen my room, I know I’ll be more than happy here for a few days. My floor is bright yellow. Later, as I’m exploring more of the hotel, I’ll notice that other floors have their own prominent colours. Each of our rooms looks as though they are individual houses from the front. I imagine people sitting in the chairs, watching the world go by. There’s no fancy technology here, an old-fashioned key turns the lock and soon I’m inside. I’m now wide awake. Wow! This room is incredible. It’s bringing all of my senses to life, my eyes taking it all in as they move firstly across the entry and then into the other rooms. The bright yellow walls continue here, forming a bright canvas for the even brighter paintings and furniture. Dark timber furniture makes a bold statement as do the unusual light fittings. The Shanghai Mansion is not stylish by accident. Its decadence is closely tied to its origins as the first Chinese Opera House in Bangkok. Over time, it became a trading house, stock exchange and a department store, before being left to deteriorate. 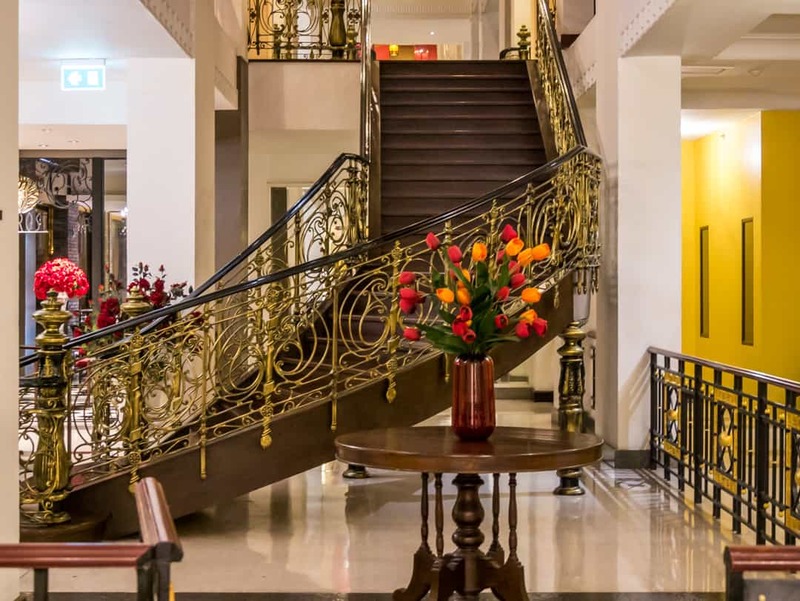 Bought in 2005 by the Burasari Group, this hotel reflects the opulent styles of Shanghai life in the 1930s. The red brocade headboard and dark velvet drapes create texture in an environment that is usually quite minimalistic. Like many beds I’ve slept on in Asia, the mattress is reasonably hard, but I personally don’t mind them that way. Pillows of a good size are available. The room is airconditioned which is good for two reasons. Firstly, it’s hot in Bangkok and this room has no windows that allow for fresh air to be circulated. Finding powerpoints isn’t easy here, although, with a bit of furniture removal, I finally find some low down to the ground, behind the bedside table. On the left-hand side of the bed, access is inhibited by the narrow space between the built-in wardrobe and the end of the bed. At night, in a strange room, I can imagine that this might be difficult for some, including me. I would normally sleep on that side, however not wanting to bang my head on a cupboard in the middle of the night, I moved across to the right-hand side which allowed for much easier movement. The bathroom area is spacious with a large walk-in shower, sporting both a rain shower head and a hand held shower rose. The water was just as I like it, roaring pressure and boiling hot. Even when it’s 40 degrees Celsius outside, I will still submit myself to hot water. The bathroom is impeccably clean. Outside the shower, taking pride of place on a raised platform, is an oversized bathtub that is at the heart of the relaxing vibe in this room. That one will have to wait for later. It will take quite a while to fill that thing. There’s also plenty of space alongside the vanity basin which I love. Not having a powerpoint in the bathroom is annoying. I’m not sure why hotels seem to only have the shaver point. It means I have to go searching for those other hard-to-find points to straighten my hair by the bedside. House branded toiletries, with the most delicious coconut aroma, are offered here. The bath towels are large and are the softest I’ve seen in a hotel for quite some time. Satin slippers and a delightfully soft satin bathrobe are a nice change to the heavy towelling ones that are common inclusions in other hotels. It’s yet another layer of personal attention and design that has me feeling right at home here. Asian hotels are generous when it comes to providing complimentary water in hotel rooms and the Shanghai Mansion was no different. A hotel of this calibre, however, will need to assess its use of single-use plastic bottles in the near future. A small fridge is located in the entryway. A basic mini bar (beer, soft drink, chips, cookies) are surprisingly included with the room rate. It’s been a while since I’ve seen a hotel with such an offer. As an early riser, I appreciated being able to take a wooden tray table with my freshly brewed tea back to my bed. Ironing boards are available on request. In the corner, you can hang up your coats or hats on a hat rack, an eclectic addition, but one that I suspect is more about decor than actual functionality. Still, I’m happy to hang a few things here. I could have also taken tea in my sitting room, perched on the velvety day bed or the chair that looks like it’s straight out of Alice in Wonderland. With no dedicated area to put luggage, I just left mine here on the polished concrete floor. The room has four fixed windows at the front. Whilst the two in the sitting room are covered with thick velvet curtains, those in the entry have only sheer curtains. If you are a light sleeper, I’d recommend taking an eye mask as the lights stay on 24/7 and will penetrate your room. It’s peaceful back here though, so earplugs shouldn’t be required. A TV and DVD player (does anyone use these anymore?) is located in the sitting room, so you can’t watch TV from bed, which is what most people would do in a hotel room I think. For those, like me, who love to stay connected, wifi is complimentary and easy to establish a connection. The unique beauty of this hotel continues across all floors, rooms and restaurants. On the third level, the Cotton Club allows you to start your day with a sumptuous breakfast buffet. Once inside the Cotton Club, if you can make your way past the mound of pastries and steaming pots of traditional Thai food, the arched windows are worthy of a look. If you’re early enough, pull up a chair alongside these windows for a birds-eye view of the busy street below. Better still, secure a spot on the couch over in the corner where you’ll find many vintage pieces including a gramophone. The breakfast service was excellent, and despite always eating some local food, personally, I love having a live egg station that gets me fuelled up for the big day ahead. For a more formal meal, settle into the quiet surroundings of the Red Rose’s and enjoy the Chinese-inspired menu. On the ground floor, the Shanghai Terrace has live music and encourages the public to take time out from busy Yaowarat Road to have a cold drink. It’s the perfect place to sit after a hot day pounding the streets of Bangkok. 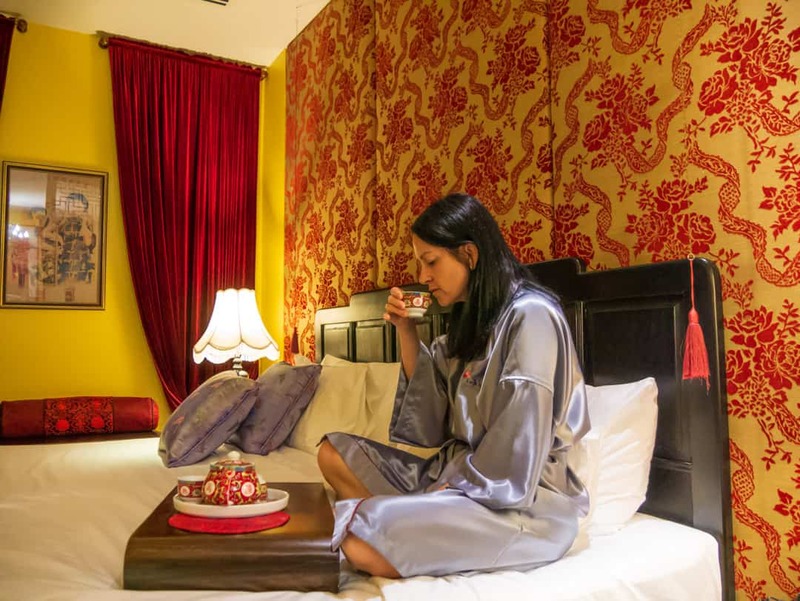 There are four types of rooms available at the Shanghai Mansion boutique hotel in Chinatown, Bangkok. I stayed in a Mu Dan Suite, which are the largest rooms in the hotel. The Mei Hua Superior rooms have double or twin beds, whilst the Ying Hua Deluxe rooms have a king-size bed. Family suites for two adults and two children are also available. Check out the reviews, pricing and availability on Trip Advisor. A small spa operates on the third level. Be sure to book as there are limited rooms available. Where is the Shanghai Mansion located? Whilst I would stay at the Shanghai Mansion just to experience the ambience and the service, it’s also one of the best hotels in Chinatown, Bangkok due to its central location. The thriving streets of Chinatown are close by, allowing you to get out and walk around, without having to worry about any kind of transport. The streets and the laneways seem like a maze, but it’s impossible to get lost. Stop along the way to watch the street food vendors. You can certainly make this into your own food tour if you like with such variety on offer. Visit the Baan Kao Lao Reung, an ancient timber house converted into a community museum. There’s a wealth of Chinese memorabilia in here, including costumes from the Chinese Opera House. Go inside the Wat Mangkon Kamalawat, the largest Chinese Buddhist temple in Bangkok. If you’re lucky, you’ll get a chance to see the Monks chanting. It wouldn’t be Chinatown without being able to find just about any type of product you’re looking for. If you need to shop and do it cheaply, this is the place to be. If gold is your thing, you’ll also find quite a supply of shops selling gold jewellery. The river is a ten-minute walk away. Hua Lamphong is the closest MRT station. Whilst it is only approximately 700 metres away, it is on the other side of the river. Walking from the station to the Shanghai Mansion will take around 15 minutes. If you are coming from Suvarnabhumi Airport or Don Mueang International Airport it is best to take a taxi, especially if there are several in a travelling party, or you have a lot of luggage. If you have limited luggage, the train would be a good option. Ensure you only use official taxis and that they are metered. Staying at the Shanghai Mansion again? The location, rooms, facilities, service and overall cleanliness were exceptional. Bangkok has many great hotels but finding the best area based on what you will be doing here becomes very important when you consider Bangkok’s traffic. If you have to rely on any kind of road transport, it’s a good idea to seriously consider where you stay. With access to the MRT, walking routes and the river and its ferries, staying at the Shanghai Mansion is a good option in this area. I’d be very happy to lay my head down in one of these exquisite rooms sometime in the future. Beer and Croissants was a guest of the Tourism Authority of Thailand. As always all opinions, editorial and images are always our own. Special thanks to Thai Airways for getting us from Australia to Bangkok.